Back by popular demand and because we had an amazing turn out at our last event, we’re going to be doing Mission Disco at Slate Bar again on September 15th! 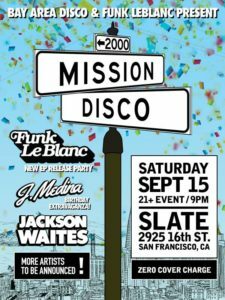 Funk LeBlanc will be debuting their latest EP that night and it’s also Bay Area Disco’s J. Medina’s birthday!!! Let’s keep this momentum going so come out and show some love!